Combination vertical shipper offers the versatility of shipping both ambient and frozen specimens in the same box. The insulated cooler section (ID: 8 x 6 x 8″) for frozen specimens includes an Aqui-Pak™ absorbent pouch that will hold up to 6 tubes and a medium 95kPa canister for secondary containment. The ambient section includes an insulated envelope, an Aqui-Pak™ absorbent pouch that will hold up to 6 tubes, a 95kPa bag for secondary containment and an ambient gel wrap to neutralize temperature spikes during transit. 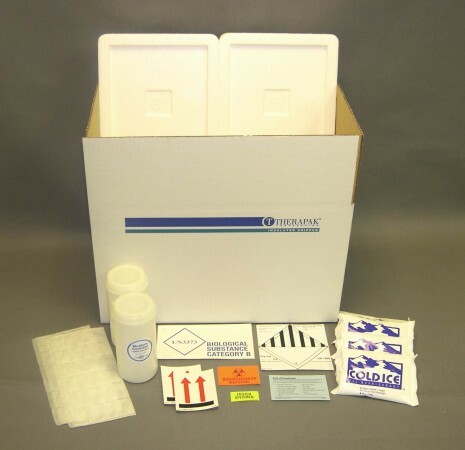 Other materials include orientation labels, list of contents card, biohazard symbol label, frozen specimen label, dry ice label, Biological Substance Category B label and transport box. Holds up to six tubes in each section for overnight shipments. Combination Side by Side shipping system utilizes two small coolers situated in one outer box. Inner packaging consists of a medium canister with an Aqui-Pak™ 6-tube absorbent pouch (for Frozen section). The refrigerated section consists of a medium canister with an Aqui-Pak™ 6-tube absorbent pouch and four cold packs. 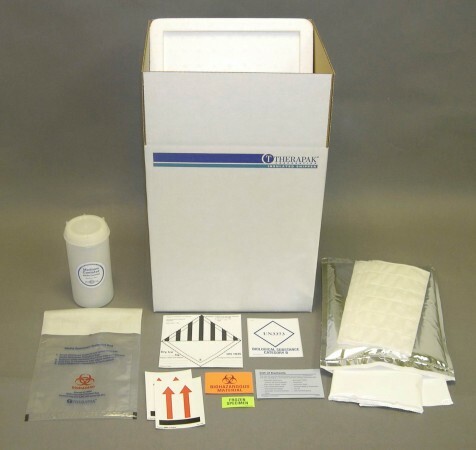 Other materials include orientation labels, list of contents card, biohazard symbol label, frozen specimen label, dry ice label and Biological Substance Category B label. Holds up to six tubes in each section for overnight shipments.